At Rule Boston Camera, we understand your imperative to be more creative while simultaneously safeguarding and coordinating volumes of original content. We apply expert knowledge and decades of experience in all aspects of media creation to help you build, maintain and refine key tools and methods for your business and your craft. It’s in our DNA. Let us put it to work for you today! 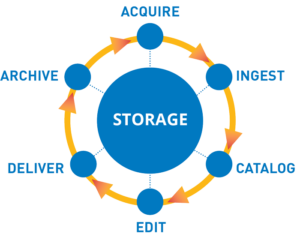 CREATE: You acquire, modify, distribute, repurpose and deliver your digital assets. SHARE: You centralize, log, access and utilize your creative digital assets in a variety of ways with a variety of people at any given time. STORE: You need a long-term, safe and cost effective method of storage for future access. With our Key Technology Partners we consult, advise, build and implement the right Shared Storage Solutions to fit the needs of your business and your budget. We have installed shared storage solutions for Top Tier Ad Agencies, Corporate, Financial and Educational Institutions, and Fortune 500 Corporations. Contact us to start your Shared Storage Conversation by email or phone at 800-rule-com.